A few weeks back I managed to get out and explore more parts of San Francisco. 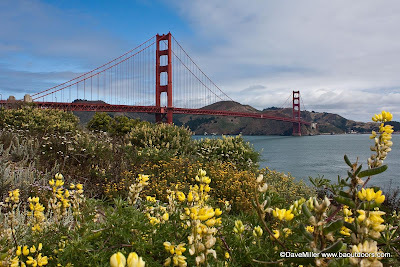 What started out as a straight photography trip turned into a great little hike featuring lots of wildflowers, the Golden Gate Bridge, Civil War gun mounts and a great beach. My photography buddy Tony and I headed out with a plan to get shots of the Golden Gate bridge and then at the San Francisco Zoo. What started out as a foggy and overcast day in the east bay, turned into a beautiful sunny day by the bay. We ended up at Crissy Field, found a parking spot and grabbed our cameras headed to Torpedo Wharf for our first views of the Bridge. Wanting more, we located the trailhead to the California Coastal Trail and headed up for more views of the iconic golden gateway to the bay. 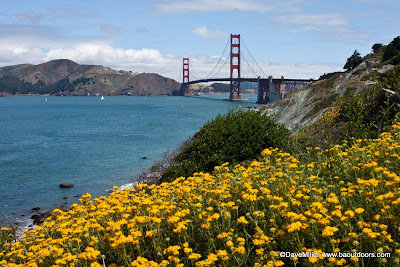 The trail up is moderately steep, but within minutes hikers are treated to full displays of wildflowers and more spectacular views of the Golden Gate bridge and the City by the Bay. 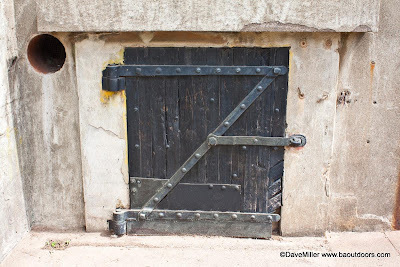 Still wanting more, we continued along the trail and came across Battery East (above), one of several Civil War (and later) battlements and ammunition caches created to defend the SF Bay. Part of the trail actually goes through a small tunnel with a very low clearance (good thing I'm short). 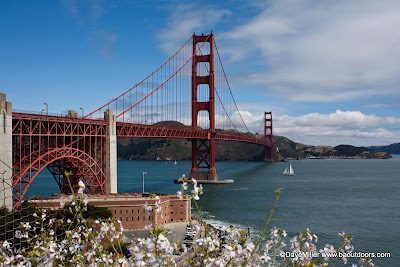 Further along is the main tourist vista area for the southern view of the Golden Gate Bridge. Still not satisfied we decided to check out the view from the "other side" and followed the trial below the bridge and on the west side. More batteries and gun mounts are along the trail. We saw the trail marker indicating that Baker Beach 1.0 mile and decided to go for it! The hike to Baker Beach was a good hike on a very well maintained trail with a mix of blacktop paths and dirt and sandy trails. Once the trail hits Lincoln Blvd, there are two options to the beach, the longer, but more gradual descent to the main parking area or the steep and surprisingly fun Sand Ladder (right). Guess which route we took. 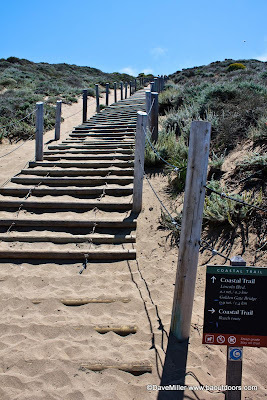 The Sand Ladder was a series of small diameter logs (about 8") connected together with cables and then laid down the moderately steep sandy hill to provide stair type steps. Very cool! 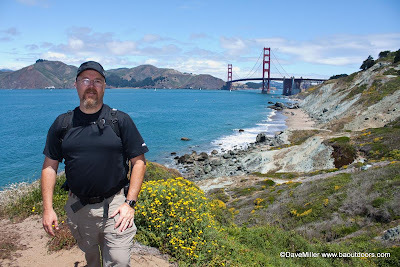 The hike from Crissy Field to Baker Beach is an easy to moderate hike with some elevation gain and loss. It is a must do venture that can be done anytime of the year, but best in the morning hours to avoid the wind and fog. 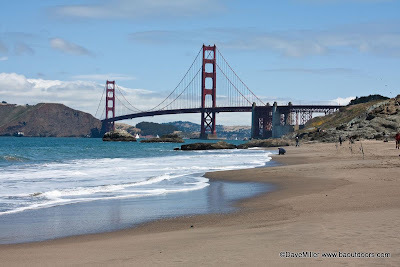 However, the view of the Golden Gate Bridge and Marin Headlands from Baker Beach on a clear evening can be stunning. Parking at Crissy Field fills up quick and can be tough to find at peak times. The hike is about 3 miles round trip. I had technical difficulties with my GPS and did not get a good track of this trail (my bad!). I will attempt to recover the trail and post it if I am able. Your comments and questions are welcome! 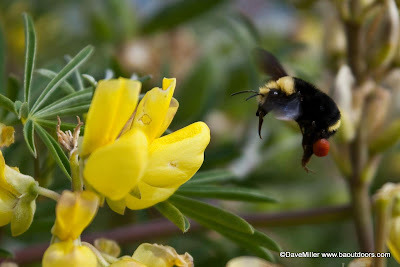 More photos from this trip, including the San Francisco Zoo, can be found at my SmugMug Gallery. Great views of the Golden Gate bridge from the "outside"